Stashbusters is a club for people who are looking for ways to "slash their stash" of fabric. New pattern and/or project each month. Show and tell of finished projects. Sharing tips, tricks, quilting knowledge. Lots of new ideas. special tools, trading time to "swap" with other club members. Gift from the grab box. Stashbusters Bucks awarded to members during the year for various activities and attendance. See below for more about Stashbusters Bucks. can be made in payments. If you have not been a member in the past, there a few copies of the past books availabe for your book choice. activities throughout the year. Get a list of how to earn bucks at the first meeting. What to do with these bucks? In March 2012, we will have an auction in which items may only be purchased using Stashbuster Bucks! From Terri M. I have been using Bonnie Hunters method of scrap organization for awhile. Her site is called Quiltville.com and here is the link to the instructions for her method. http://quiltville.com/scrapusersystem.shtml I am using this system in my sewing room now and would love to bring it and show how I do it. The Stashbusters Auction was a big hit! Susan has promised to make the next one even better, and already has plans to buy and collect items so that the 2015 auction will be even better. Auction is now twice a year. April's Stashbusters meetings starts a new year of Stashbusters. Everyone needs to sign up again. Don't forget to sign up online and pay your membership fee to get your extra bucks. August meetings are scheduled for 1 p.m. Saturday, August 8 , and/or 6 p.m. Monday, August 10, at Hyderhangout. The trade fabric for August Chunks anything goes. Chunk is too small to be a fat quarter, but too big to be a five inch square. 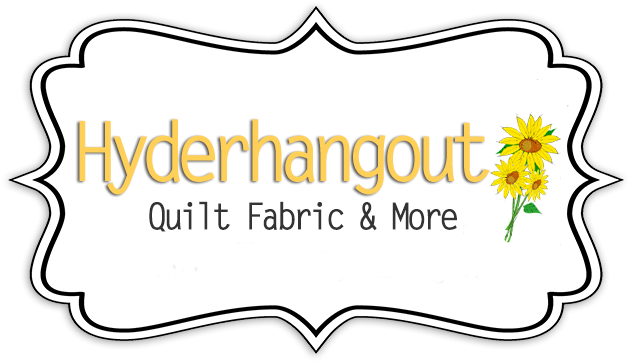 Some of you may not have any you want to give up , so Hyderhangout has some with Stashbusters Discount to choose from. The more you bring the more you can trade. The group has said they want to throw them all in the middle of the table and then take out the same amount they threw in. The demo ... Demos earn 25 Stashbuster bucks, so put on your thinking caps and call 423-715-2908 or email Susan@hyderhangout.com to schedule one. If you want to participate in the 1/2 square triangles exchange, but don't want to use your stash, Susan has reasonably-priced "Triangles on a Roll" cinnamon sticks available for purchase. For questions, about this project, contact Debbie B. (Note: this is not just for Stashbusters, so tell your quilting friends! The more people participating, the greater variety of triangles we can exchange. We are changing to the 4 inch finished blocks so that we can add them together with the 2 inch finished blocks and make some neat quilts. We are also adding 4 inch finished half square triangles to go with the 2 inch.